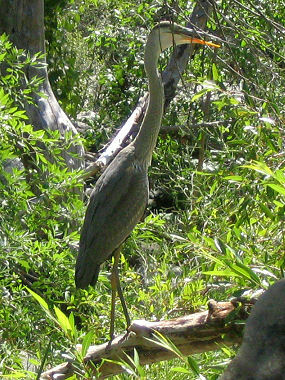 The Great Blue Heron is a long-legged wading bird and the largest North American heron. The bi rd stands 4 feet tall and has a wingspan of 6 feet. It is mainly grayish in coloration with blue-gray wings and back, whitish underparts, a white head with a dark streak and a pale or yellowish bill. The bird has one of the widest ranges of any North American heron and are found in riparian habitats in the desert, including rivers, ponds and marshes. Herons are often confused with cranes. They can be distinguished by the fact that the herons fly with their necks folded back, while cranes fly with it straight out. 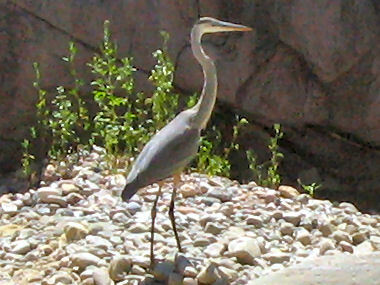 The Great Blue Heron often feeds while standing still or slowly wading in shallow water. It eats fish, lizards, frogs, crawfish, rodents, and insects. The heron usually catches food by impaling the prey on its long, sharp bill. It then tosses the dead prey into the air, and catches it with its mouth. Most Great Blues nest in colonies in tall trees; their nest is a large, flat, well made platform of interwoven sticks lined with twigs and leaves. Females lay 3-7 pale green eggs in each clutch which takes 28 days to incubate. Both male and female herons tend the young after they hatch. The chicks are usually able to leave the nest after about two months.